It’s my favorite cookie and sweets baking time of the year, as most of you know, and I’ve been doing quite a bit of entertaining this holiday season. I truly feel no holiday party is complete without a beautiful display of Christmas cookies and this year is no different! The peppermint brownies I posted last have been a hit and I’ve made them a few times since then and I promise if you make a cookie tray with those peppermint brownies and these sunflower seed buckeyes it’s guaranteed you’ll get lots of holiday party invites next year! I grew up loving the whole peanut butter chocolate combination however the mister has a peanut allergy and because of the allergies with my clients I haven’t kept peanut butter anything in my house for the last 10 years. But I still was craving that salty sweet chocolate mixture. Welcome in Sunflower Seed Buckeyes. I had to make two batches of these just in the past week because the mister ate basically the entire first batch in two days. Yep. I would catch him sneaking into the fridge like a kid caught with his hand in the cookie jar. It was actually adorable that he was so excited about these little nuggets of deliciousness. I mean, after all, if the ones you love don’t also love your food then what’s the point? So, make these little balls of yumminess. You’ll bite into the salty slightly crunchy slightly creamy center and finish with a nice coating of chocolate on the outside. A happy little bite of Christmas goodness. And, like everything else, these babies are also formulated to be free of any of the top-8 food allergens so you can make them gluten free, soy free, dairy free, nut free and they are still damn delicious. Add the sunflower seed butter, unsalted butter, powdered sugar and crushed graham cracker crumbs to the bowl of a food processor. Add a little sprinkle of salt if you like (I do!) and turn the machine on. Let it run until your mixture is well mixed. Likely it will form a large ball that will begin to roll around the food processor. Note, if the mixture is too sticky then add a few more crushed graham cracker crumbs. If it is too dry and crumbly then add a little more sunflower seed butter. 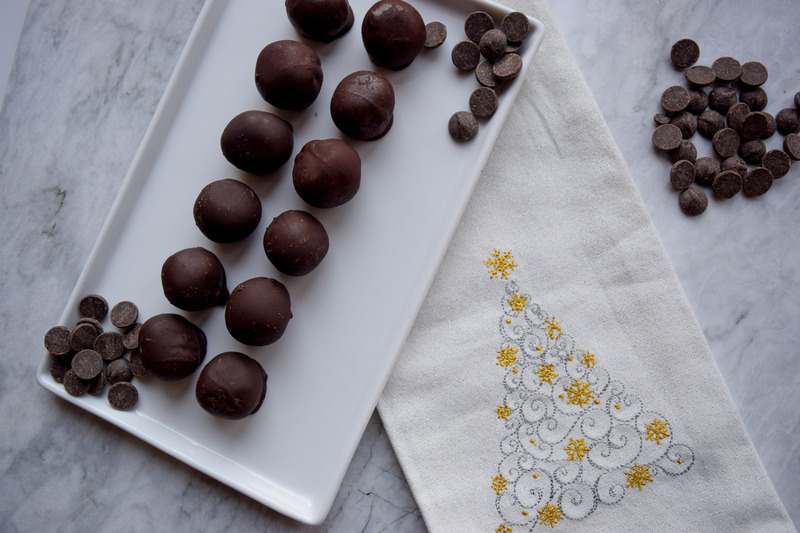 Scoop out into heaping tablespoon balls onto a parchment lined baking sheet. Roll into smooth balls and place in the freezer for at least 30 minutes. Meanwhile, melt the chocolate and oil either in the microwave at 30 second intervals or on the stove in a double boiler until smooth. 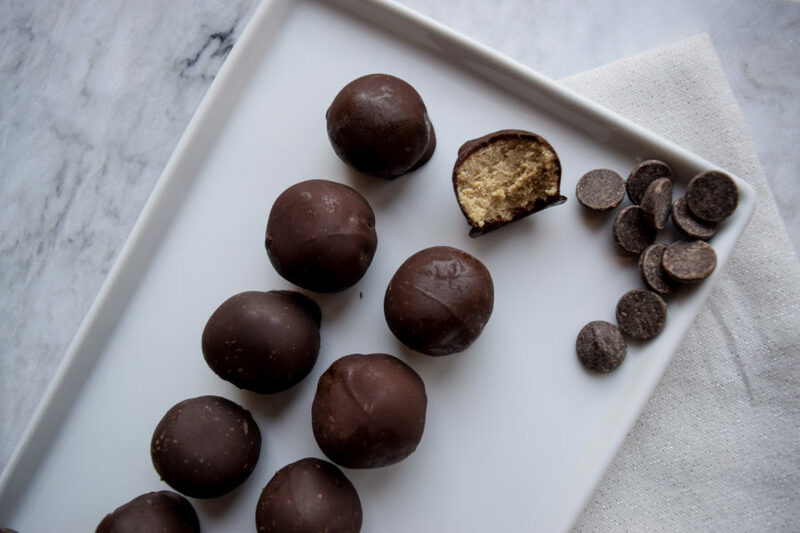 Remove the sunflower seed butter balls from the freezer and one by one coat in the chocolate mixture, placing back on the parchment paper. Place in the refrigerator to completely harden and then place in an airtight bag or container. They’ll keep about a week in the refrigerator, about a month in the freezer. *To make dairy free: Use a vegan, allergy friendly margarine. **I like to use the Enjoy Life Foods Crunchy Graham Cookies for this!